Showing 34 articles from April 26, 2017. LOUISBURG -- Heroin and opiates continue to be silent killers -- claiming about two Franklin County lives a week, generally under the radar, law enforcement officials said a year ago. One of those lives belonged to Austin Quinn, a 24-year-old Bunn High graduate who died as the result of an overdose in November 2016. His mother and father, Kathy and Robbie Quinn, say it's something they'll never forget. 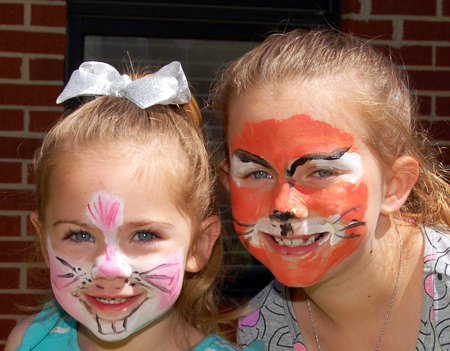 FRANKLINTON -- Organizers of this year's Relay for Life want a storybook ending in their fight to slay cancer -- befitting this year's theme of Once Upon a Cure. Every relayer has a story. Every survivor has a story. Every caregiver has a story. The Franklin County Relay for Life asks: What is your Relay story? "[Cancer] doesn't discriminate," said Danette Cheatham, who is co-chairing this year's event with Jessica Nicholson-Bland. "It affects all groups. LOUISBURG -- Rick Lassiter didn't leave the police department this week with a golden watch, but he did receive goodbye messages rich with sentiment. Last month, Lassiter announced his retirement from the police department, the last 14 as chief. His last day on the job will be Friday, April 28. 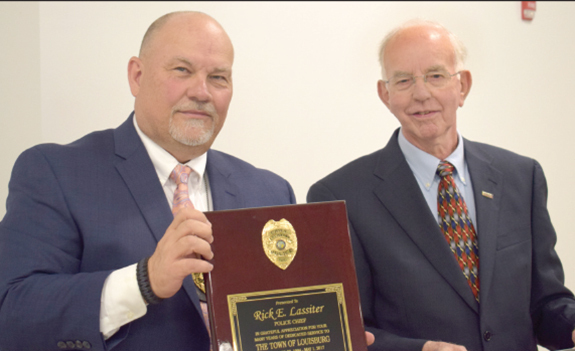 Town officials and staff hosted a goodbye luncheon on Tuesday, making Lassiter the center of attention and sharing stories of how Lassiter made the town and department better during his tenure. 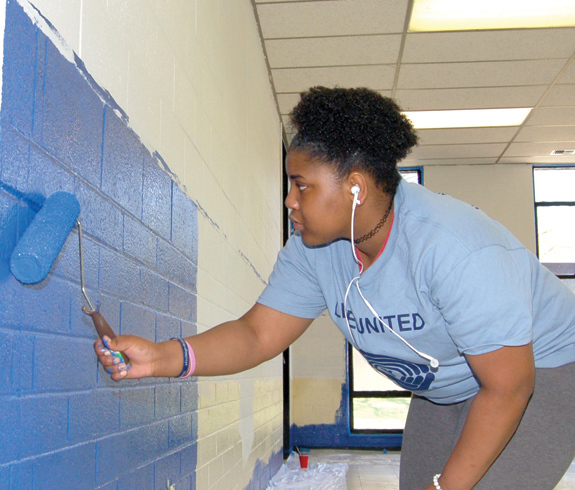 LOUISBURG -- Louisburg College student Jumana Ayni didn't always know there was a Boys and Girls Club in Franklin County. But when she discovered it, she hoped to make an impact that she and the children who go there wouldn't forget. 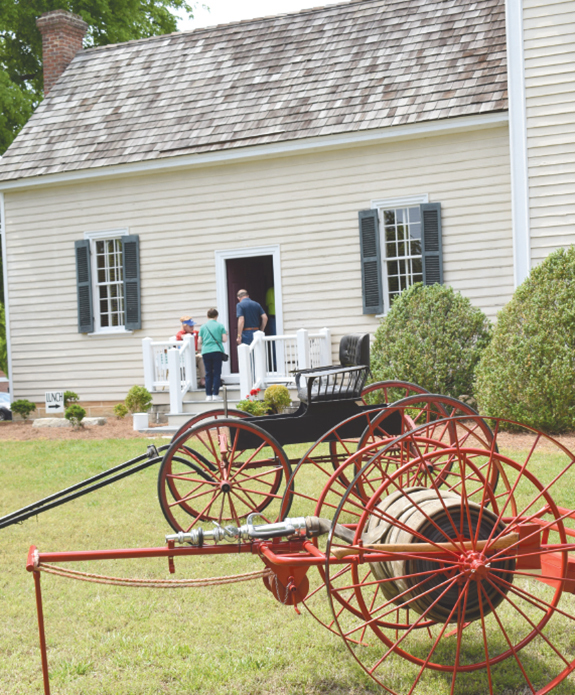 This year's Franklin County Historic Homes Tour featured more than homes and churches as evidenced by this vintage piece of fire equipment and a buggy that were on display on the lawn of the Person Place. The fire fighting device, recently acquired by the Louisburg Fire Department, is not original to the town but is virtually identical to one that was used here in the very early years of the 20th Century. Pulled to a scene by firemen, the device carried a roll of hose that was attached to a fire hydrant. It carried no water and had no pump, relying solely on the water pressure from the hydrant. Okay, let's be kind and call it a technical foul -- then set the record a little straighter. Our senior U.S. senator, Richard Burr, made one of his very rare appearances in Franklin County last week -- to accept an award, naturally -- and voiced his support for improving U.S. 401. Now, I'd be willing to bet lunch that the good senator couldn't find U.S. 401 in Franklin County without a map or GPS -- but we'll let that slide. The litter problem in Franklin County is getting worse -- and solutions seem impossibly elusive. We've long pointed out the problems along our roads and highways caused by people who carelessly and irresponsibly roll down their vehicle windows and toss out whatever happens to be in their hands. Beyond the mess this creates is the troubling fact that many times the litter is empty beer containers, wine bottles and, frighteningly as it may seem, even liquor bottles. World peace. Fixing the economy. 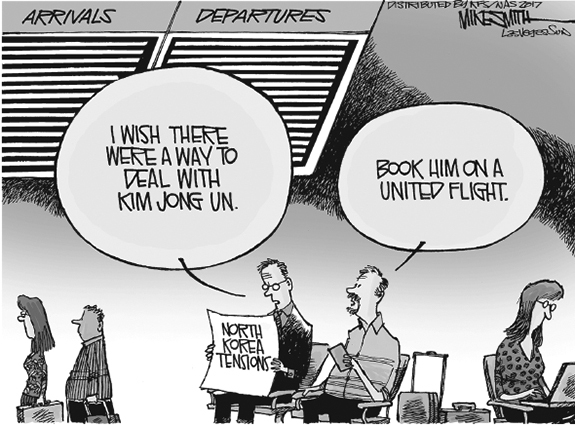 Government accountability. Those are the kinds of issues most people see and wonder: what, on Earth, can I do about that? 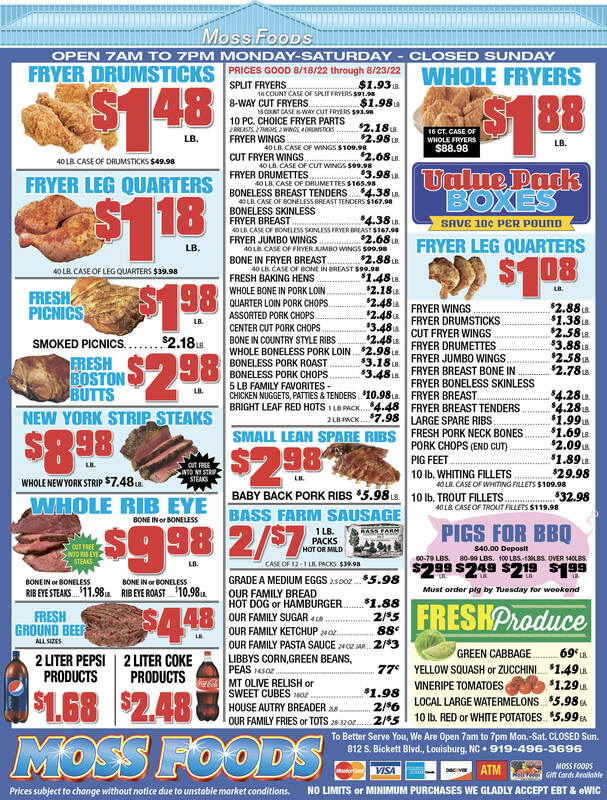 Well, if hunger in your community is on that list, there is a chance to help put a big dent in that problem in Bunn this weekend. The Bunn Family Dentistry is hosting its 7th annual Bunn Fun Walk/Run -- and this year's goal is to help support A Blessing Inc.
WHITAKERS -- Funeral services for Bobby Lee Ricks, 70, who died Saturday, April 22, 2017 will be held today, Thursday, April 27, at 1 p.m. at Union Hill Baptist Church in Nashville, with Dr. Everett Jenkins officiating. Burial will follow in the Oakland Cemetery. LOUISBURG--Funeral services for James A. Burgess Jr., 55, who died Sunday, April 23, 2017, will be held Friday, April 28, at 12 p.m. at Walnut Grove Baptist Church in Louisburg, with the pastor, Rev. Dr. Timothy J. Walker Sr. officiating. 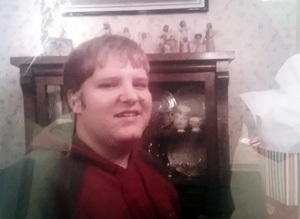 Burial will follow in the Spivey family cemetery. LOUISBURG -- Aside from her four years in college, Erica Wammock has been around Louisburg High School since the mid-1990s -- first as a student and now as LHS' volleyball coach and athletic director. Because of that, it's safe to say that Wammock is an expert on LHS athletics. So when Wammock says that Monday's college signing event was a recent first for the school, chances are that statement is true. 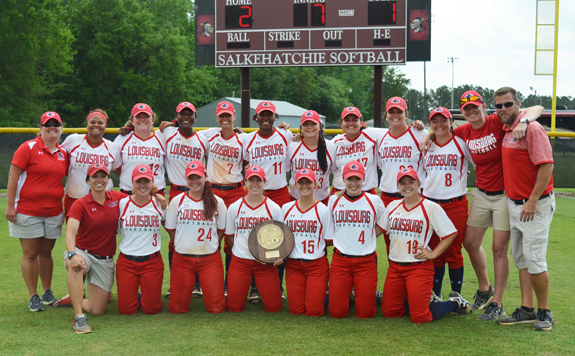 LOUISBURG -- After soaring through the regular season in almost-unbeatable fashion, the Louisburg College Lady Hurricanes entered the Region X Softball Tournament as the prohibitive favorite. Coach Michelle Carlson's club certainly didn't disappoint as Louisburg roared through trio of overmatched opponents during the annual event, which was completed Sunday at the University of South Carolina-Salkehatchie Softball Field in the Palmetto Field. GREENSBORO -- The North Carolina A&T Department of Athletics held its annual All-Sports Banquet Monday night, labeled the Aggie ESPY's. 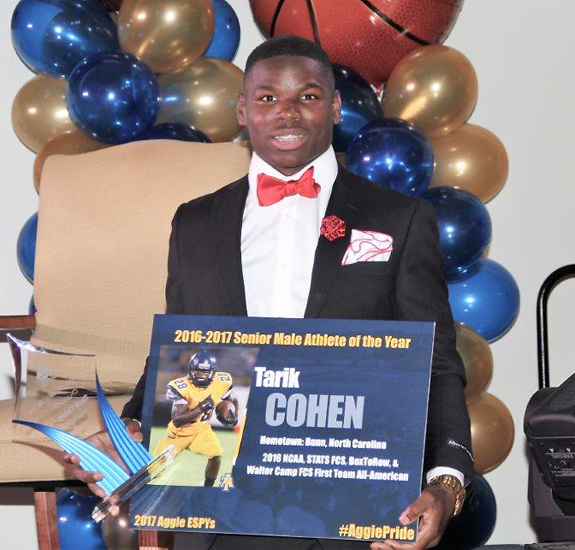 It was a big night for football's Tarik Cohen (Sr.), who closed out one of the greatest careers in Aggie Athletics and Mid-Eastern Athletic Conference history. Cohen, who prepped at Bunn High School, won N.C. A&T's top male award by being named Male Athlete of the Year for the third straight year. Therefore, Earl M. Hilton III, N.C. A&T's director of athletics, named the award after him. 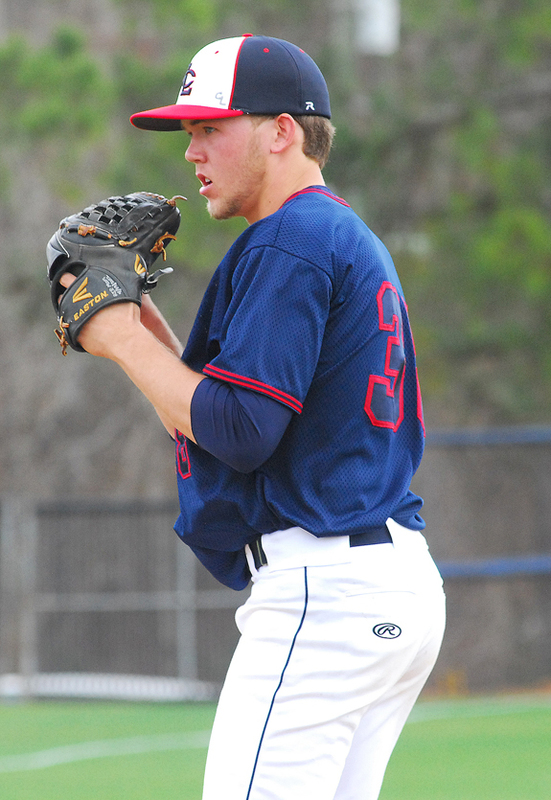 LOUISBURG -- Louisburg College needed to take care of business last weekend in order to secure home-field advantage for a first-round series in the Region X Baseball Tournament. Coach Blake Herring's squad showed some savvy by getting the job done as the Hurricanes claimed three outings of a four-game series at the University of South Carolina-Salkehatchie to close out regular season action in the league. SARAH FOSTER SIGNS. 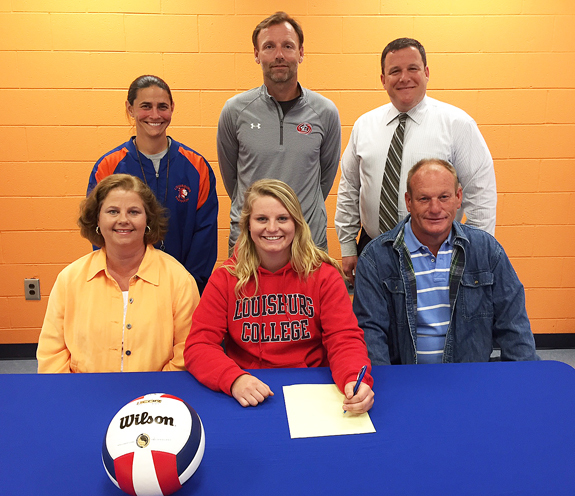 Louisburg High School's Sarah Foster signs a letter-of-intent to continue her volleyball career at Louisburg College. Also pictured are (back, l to r) LHS Athletic Director/Coach Erica Wammock, LC volleyball coach Jon Garner and LHS Principal Glenn Dansky; (front, l to r) Leslie Foster (mother) and Arnie Foster (father). QUAMON PERSON SIGNS. 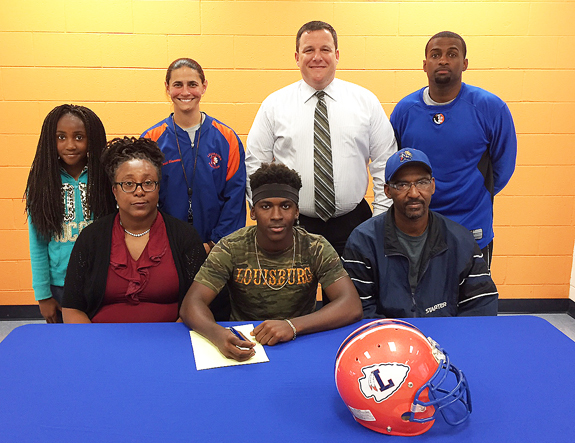 Louisburg High School's Quamon Person signs a letter-of-intent to continue his football/baseball career at North Carolina Wesleyan College. Also pictured are (back, l to r) Taliyah Person (sister), LHS Athletic Director Erica Wammock, LHS Principal Glenn Dansky and LHS football coach Dontae Lassiter; (front, l to r) Jackie Person (mother) and Willie Person (father). 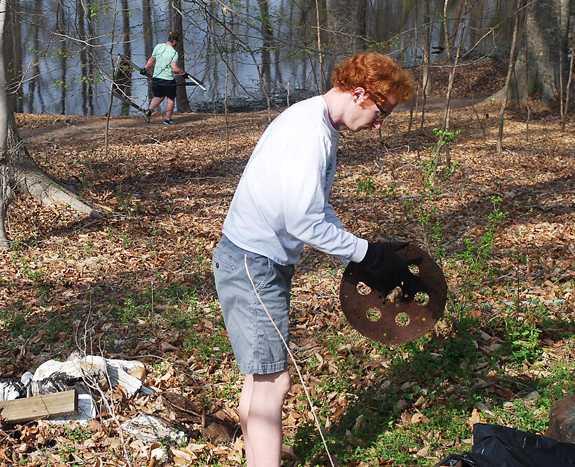 LOUISBURG -- A pond shrouded in woods behind the baseball field at Louisburg College will become the centerpiece of a trail and recreation area for the college community. For decades, students escaped to the woods, carved their initials in the Beech trees and cast fishing lines in the pond. Some of the carvings date to the 1920s; some are as recent as the 1990s. LOUISBURG -- Louisburg College controlled the season-long proceedings in the Region X softball standings, so it was no surprise when the Lady Hurricanes took home the major hardware at last Friday's annual league awards banquet. 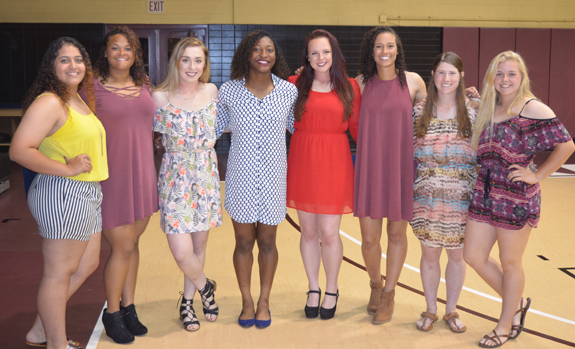 Eight Lady Hurricanes were saluted at the event, which was held at the University of South Carolina-Salkehatchie in conjunction with the Region X Tournament. LC's Haley Hutchins was tabbed as the Region X Pitcher of the Year, while shortstop Monica Pepe was the pick as the Player of the Year. CONTINUED EXCELLENCE. 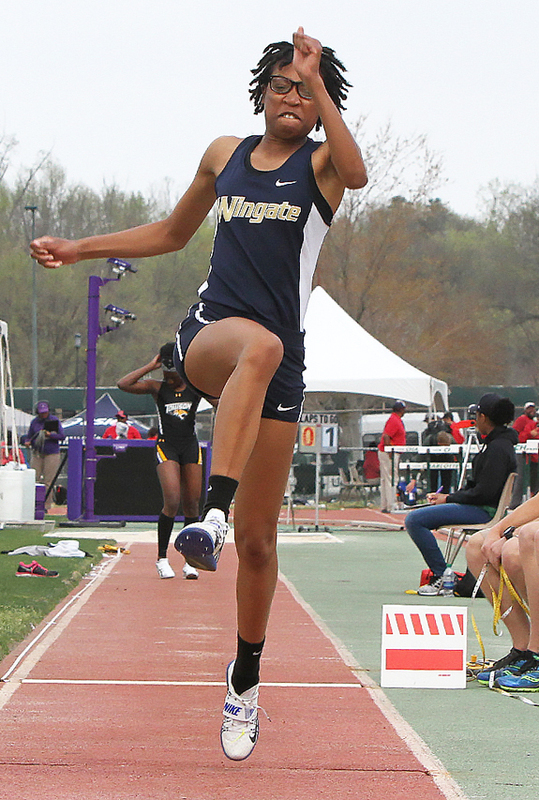 Vanisha Wilshire, who won multiple state championships at Louisburg High School, is now a sophomore star at Wingate University near Charlotte. During the recent South Atlantic Conference Track and Field Championships in Hickory, Wilshire helped the Bulldogs win the team crown. Wilshire was the individual winner in the high jump and triple jump -- and set a new conference record in the triple jump. 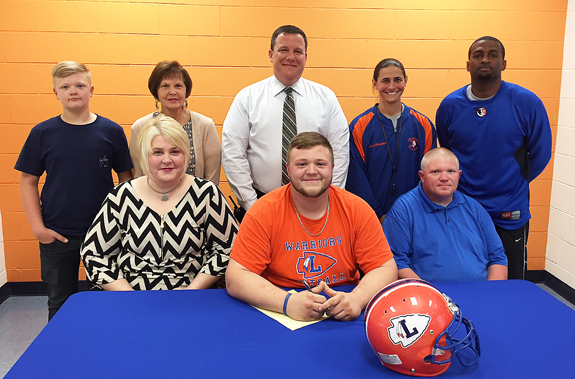 Louisburg High School's Noah Allen signs a letter-of-intent to continue his football career at North Carolina Wesleyan College. 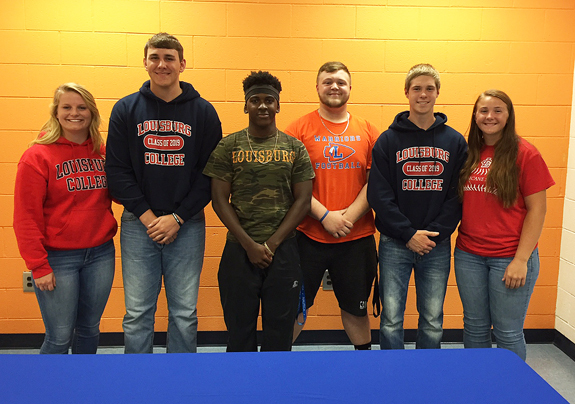 Also pictured are (back, l to r) Landon Allen (brother), Wendy Snell (grandmother), LHS Principal Glenn Dansky, LHS Athletic Director Erica Wammock and LHS football coach Dontae Lassiter; (front, l to r) Brooke Allen (mother) and Ronnie Allen (father). 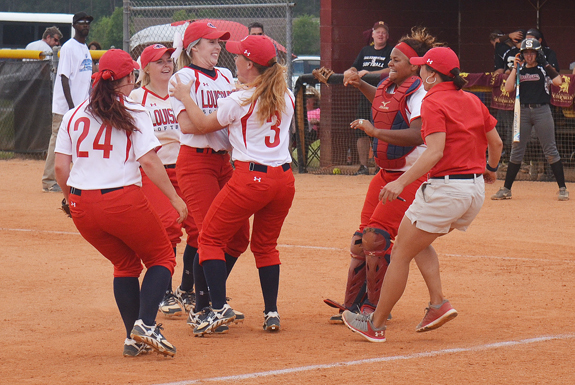 The Louisburg College Lady Hurricanes celebrate after registering the final out of the Region X Tournament. 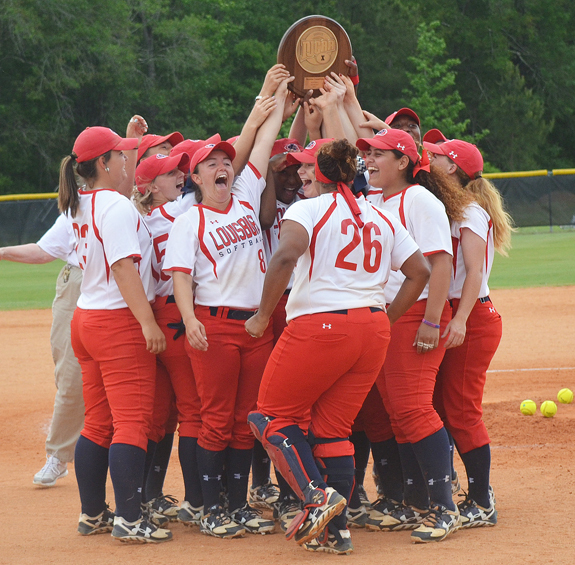 Members of the Louisburg College softball team celebrate after the Lady Hurricanes accepted their second Region X Tournament Championship over the past three seasons. 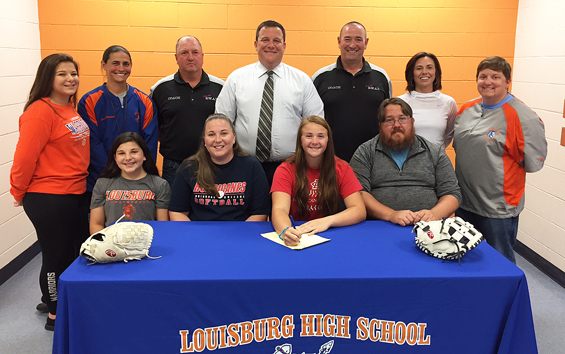 Louisburg high School's Summer Phillips signs a letter-of-intent to continue her softball career at Louisburg College. 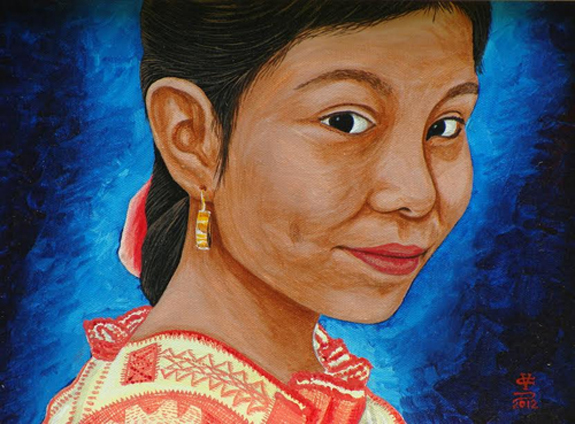 The Franklin County Arts Council will celebrate Cinco de Mayo on Friday, May 5 from 4 p.m. until 7 p.m. at UpFront Gallery in downtown Franklinton with an arts exhibit by five Hispanic artists. There will be live music: "Songs of the Soul" provided by Teresa Fernandez and Ramon Brito playing the Hispanic harp. Artists exhibiting are Cornelio Campos, Nora Hernandez, Clina Polloni, Gabriela Zabala, and Arron Vick. Cornelio Campos is a Mexican artist born in 1971 in Cheran Michoacan-Mexico. An acclaimed Steinway artist will return to Cherry Hill at 3 p.m. Sunday, April 30. Vincent van Gelder delighted his Inez audience in 2016 with his virtuosity, and this year's performance promises to equal the first, he said. Van Gelder was born in Rotterdam, The Netherlands. 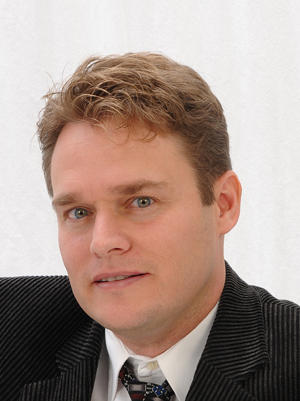 He studied at several academies and universities in Holland, Latvia, and the United States, receiving two masters and subsequently a Doctor of Musical Arts degree in piano performance from the University of Missouri. 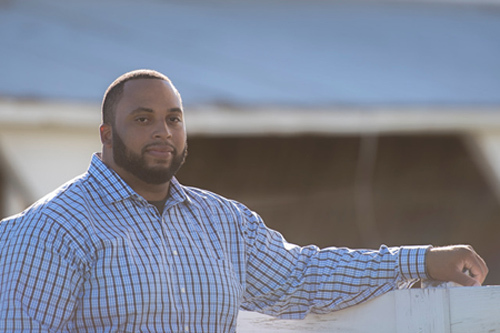 A former NFL lineman who walked away from his football career to become a Franklin County farmer will deliver the Commencement Address at Louisburg College's graduation Friday, May 12. Dr. Mark La Branche, Louisburg College president, will be featured speaker at Baccalaureate, scheduled for 4 p.m. Thursday, May 11, at Louisburg United Methodist Church. LOUISBURG -- Police arrested a school system employee on charges that he assaulted a student. Arthur W. Hylander Jr., 46, was charged with misdemeanor simple assault after police allege he assaulted a Louisburg High School student during an incident on April 24. According to the report by Sgt. Joe Sherrill, Hylander engaged in an argument with the student. FRANKLINTON -- Sheriff's deputies arrested a 17-year-old they allege shot and killed a dog during a home break in. Luis Hernandez-Cruz has been charged with felony cruelty to an animal, felony breaking and entering, four counts of felony of a firearm, possession of a stolen firearm, larceny after breaking and entering, and misdemeanor larceny. He was placed in the Franklin County jail in lieu of a $355,000. YOUNGSVILLE -- Heavy rain and the inflow of stormwater caused a wastewater spill on Tuesday, county staff said. According to staff, the system recorded spills at two separate locations, one in the Youngsville District and the other in the Franklinton District. The spills occurred after receiving heavy rainfall over the course of 56 hours. The main cause of both bypasses is attributable to the direct inflow of stormwater into the sewer collection system. 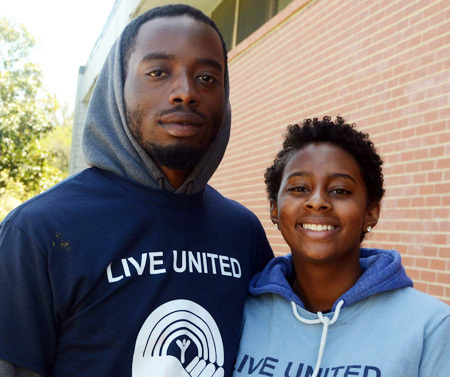 Jumana Ayni, right, and fellow Louisburg College student Tararius Barnes II at the Day of Caring. 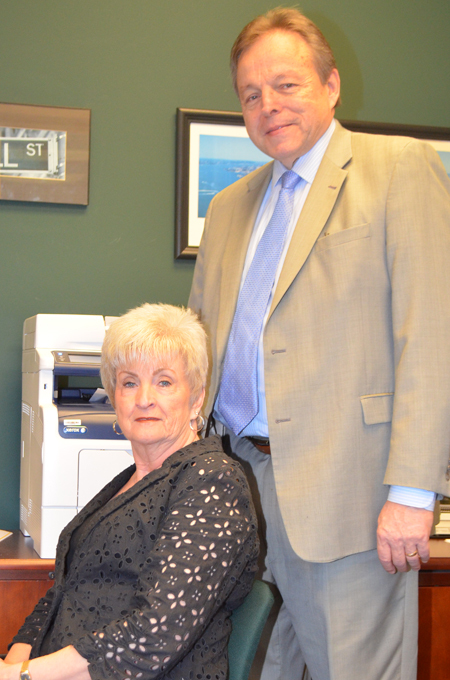 Ed Armstrong, financial advisor at Edward Jones in Louisburg, congratulates Nancy Aycock on her recent retirement. Aycock has served as branch office administrator since August of 1999, taking care of the details of the operation. According to Armstrong, Aycock is loyal, very smart, and learned how to do everything. "She is reliable and valuable beyond measure," Armstrong adds. Aycock plans on traveling, fishing and spending time with her family.